Sushi Central, Abu Dhabi’s favorite sushi joint is now open in Dubai. Heard so much about this place from my Abu Dhabi based friends that, I had to visit them as soon as they opened their outlet last week in Dubai. 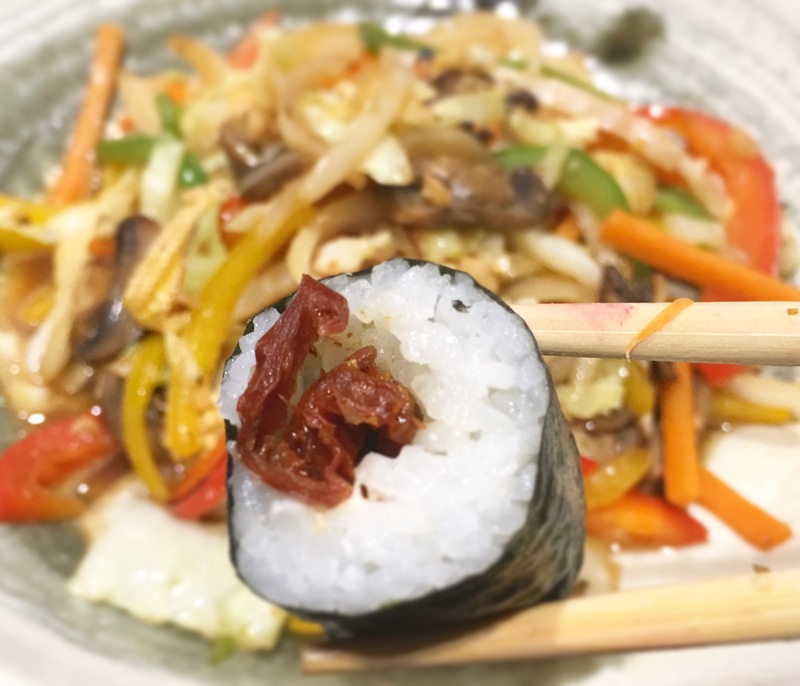 Sushi Central has 4 outlets in Abu Dhabi and has been awarded Best Japanese Restaurant (below AED 400) by What’s On Abu Dhabi three years in a row, and are the leader in sushi delivery in Abu Dhabi. Their first outlet in Dubai is located in the ground floor of DAMAC Maison Canal Views hotel apartment in Al Abraj Street, Business Bay. As we are familiar with the Business Bay Area, we could reach the restaurant without any hassle. Sushi Central has simple and minimalistic decor. It has a vibe of a contemporary sushi cafe in downtown Tokyo, with dim lighting and comfortable seating arrangement. Its a perfect place for a quick lunch or an elaborate dinner. Their menu is huge, with a wide range of Japanese inspired food including sushi rolls, sashimi, hot dishes and desserts. Sushi Central offers high quality Japanese inspired cuisine that is affordable. I loved the fact that most of their dishes are healthy. Sushi Central brings you the ultimate health food. Our dishes are best served with modern twist of fresh and exciting concepts. Order from our readily available menu and leave the rest to us. The Sushi Central team will promptly deliver your take-out in an elegant and practical packaging that seals in the freshness and compliments the perfection. Sushi Central caters for your sense in adventure and refined palate, bringing gourmet food straight to your door. 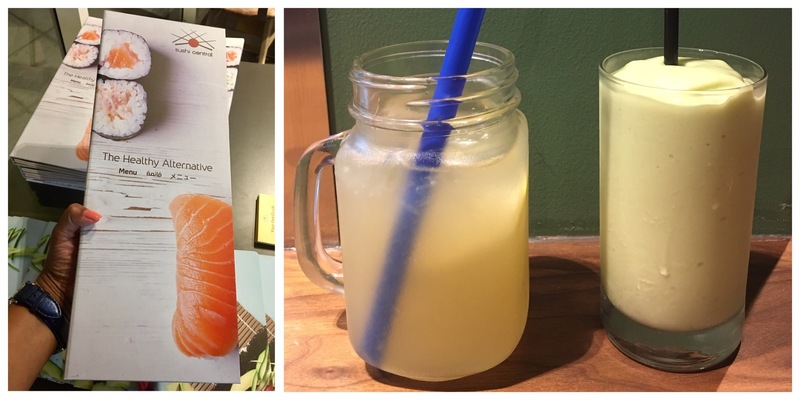 We started our dining experience at Sushi Central with drinks- Ginger & Lemon Homemade Iced Tea and Freshly Squeezed Avocado Juice. The drinks were tasty and refreshing. Pirikara and Walnut Salad was fresh and crunchy, made with julienned carrots, red cabbage, mixed lettuce and walnuts in a slightly spicy pirikara dressing. Next we ordered the panko crusted Agedashi Tofu that was served with Tempura sauce. It was too bland for our taste buds. From their specials, we were recommended to try Ortaggio. It had a rice covering outside and was stuffed with grilled asparagus, eggplant, baby corn and tapenade from inside. We relished this amazing dish. We also ordered two of their Hosomaki- Avocado Cucumber and Tomato Sun Philly. It had toasted seaweed on the outside and a filling inside. We liked both the Hosomaki, but our favorite was the fab tasting Tomato Sun Philly. Mixed Vegetable Teppanyaki was crispy and tasty. Vegetable Yaki Udon stir-fried noodles was wholesome and oh-so-delicious. The portion size is big and can easily be shared between 2-3 people. For dessert, we ordered Banana Tempura with Chocolate Sauce and Black Sesame Ice Cream topped with Mochi. The Banana Tempura was good, but the homemade Black Sesame Ice cream topped with Mochi was outstanding. Its an utterly tasty and unique dessert. Highly recommend it. We ended our dinner with a cup of rich and refreshing Japanese Green Tea. We loved our dining experience at Sushi Central. The food, the drinks, the service and the atmosphere was good.